On even-numbered years, Jak’s kids are with us for Christmas, and we often end up spending the holiday with his extended family as well. On odd-numbered years — like this one — the kids spend Christmas with their mother, and Jak and I are usually alone. I wasn’t too keen on buying a whole tree for just two people. Jak and I are both moving more towards an ‘experiences not stuff’ philosophy, which means there wouldn’t be huge piles of presents to put under a tree anyway. I was thinking about going out to buy a locally-made wreath from a farmer’s market, but knew that would probably cost about as much as a tree. Jak, however, was clever enough to realize that we basically live in the middle of an evergreen forest, and that this might be turned to our benefit. 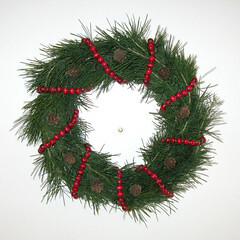 He proposed that we make our own wreaths and was willing to spearhead the required organization. I’ve never done anything remotely similar before, and frankly, going into this I wasn’t optimistic that we could make anything that looked even halfway decent. But I was surprised and pleased with the results. So to begin with, Jak and Claire ventured out to the yard and returned with branches of pine, Douglas fir, and holly, plus a pile of pine cones. 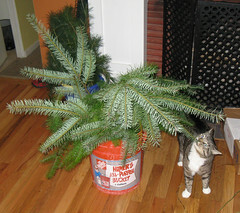 (That’s our cat Sammy there on the right, inspecting the Douglas fir.) The three of us set up on the cardboard-covered dining table, with the laptop playing a Pandora holiday music station. First challenge: all the online instructions we found either started with a purchased wire frame or described making your own from a wire coat hanger. We had zero of the former and only one of the latter. The best bit of luck that we had was when Jak remembered a roll of chicken wire we had in the garage (purchased some years back to patch a hole in the fence of our rental house and prevent puppy escape). 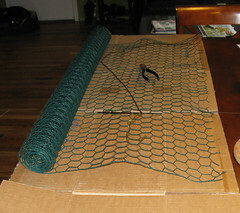 Not only did a chicken-wire circle give many more attachment points than the single circle of a coat hanger, but it even happened to be a camouflaging dark green! In addition to the chicken wire, we scrounged a spool of 30-gauge wire from a craft box (I think a slightly thicker gauge would have been better, but this worked well enough). Our tools were wire cutters and pruning shears. Jak and Claire traded off working on one wreath, while I (being the greater perfectionist) did a second one on my own. Despite having looked at several sets of instructions, I still really felt like I had no idea what I was doing when I started; I went mostly on instinct plus trial-and-error. I started by clipping a doughnut shape out of the chicken wire (I picked up the dog food dish and traced it in order to keep my circles circular). 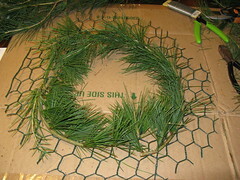 Then I started trimming pine branches and weaving them around the inner cutout, securing with small bits of wire when needed. 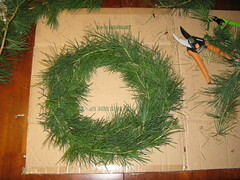 I had vaguely thought that I would use the softer, more flexible pine as the base and layer some Douglas fir branches on top (which is what Jak ended up doing with his wreath), but by the time I had a solid base, the pine was looking nice enough on its own that I decided to just keep going with that. So I added another ring of pine around the outside, tucking the cut edges of the chicken wire under to secure the branches. Then I took some shorter pieces and filled in a couple of thin spots. By the way, it works best if you face all the branches in the same direction. Jak had only been able to reach one clump of holly berries, so I let him use those and instead dug out a garland of painted wood beads from my tree decoration box. Still making this up as I went along, I wrapped it around the wreath and tucked the extra ends along the back. The spaces in between cried out for pine cones, then, so I threaded those in. So there’s my final wreath, hanging on the front door. I’m pretty proud of it, especially for a first effort. 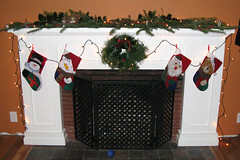 Jak added fir, holly, and a bow to his and hung it over the fireplace. Originally he thought he might try a garland, but we were pretty well crafted-out by then, so he just laid sprays of fir and pine cones across the mantel. Total cost: zero — we used only materials we already had. I ended up enjoying the creative challenge much more than I’d imagined — so much that I would like to make it a new tradition for every at-home Christmas. Even if at some point we move away from the Pacific Northwest and all its evergreens, I will still be looking for ways to forage for holiday decorations.